Since we are being a bit slow in clearing the front yard because of the rain, I thought I would elaborate more as to how we bought our property. Brodie's mum lives in Montville, QLD and just around the corner she had an ex work colleague who had fallen on hard times. He was heading off to rehab and needed someone to look after his dogs and cat. We had a look at his place and decided to take it on. From the beginning his plan was to sell when he came back. We had to spend many weekends cleaning up so we could move in. I don't think he had realised how bad it had gotten and thought it was ok, but it really wasn't! We didn't do a lot of outdoor work while we stayed there for 6 months, as we weren't sure if we could afford/he would sell to us. We also had plenty to do in the house. When we were able to buy it, he agreed to our offer and we were very excited! There aren't many 1 acre blocks up on the range, and none for the price that we got it. There is a catch though - there is a LOT of work to do. I thought I would post some before/after photos from when we moved in for real (March this year) to now. This is from the street. Me looking very pleased and ready to work. This is the driveway when we first started house sitting. 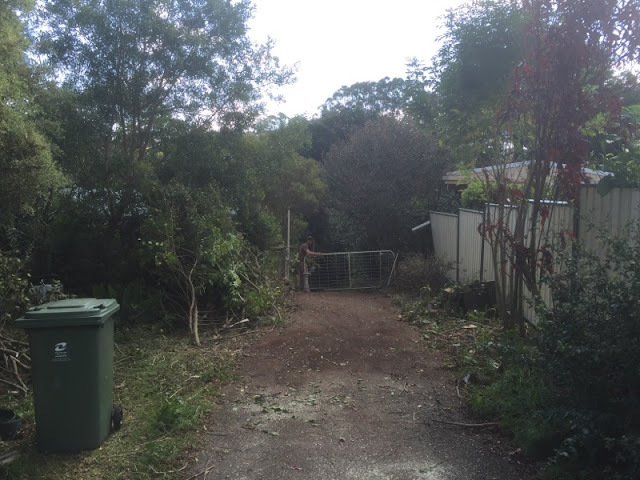 After one day Brodie and his arborist mate cleared the whole driveway so we could get down the back. I have more photos but not really good before and afters. 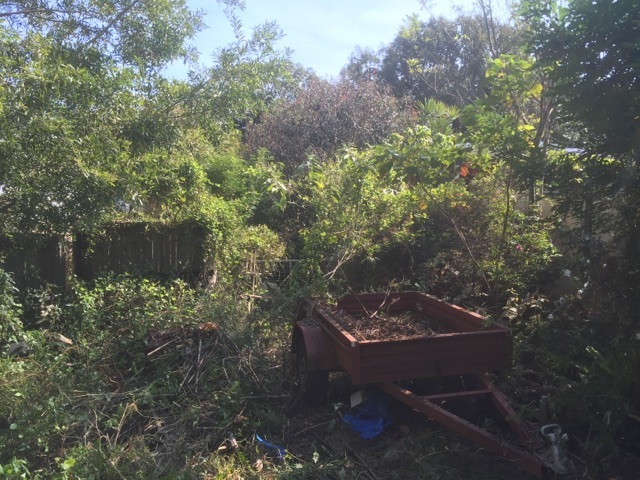 This weekend we are planning on finishing clearing the front yard so we can get a pad ready for our water tank which is due to be delivered in early December. Lets hope for a nice clear and cool weekend. I can remember those earlier days Kat when you both first started on the inside before purchasing. It has gone by so fast and you have done so much. A great feeling knowing it’s yours too in a beautiful area. Yes we have done a lot so far. It doesn't seem like it until I look back! It has really been worth all the hard work we put in at the beginning to have our own fabulous and large property. I'm glad you enjoyed it Chris. You have no idea about the work ;) there was sooo much to do on the inside just so we could live in it which was rough at the time but eventually secured our now much improved and loved abode. Thanks, I am looking forward to it! It is very satisfying Lyndie. We are slowly getting there! It doesn't feel like much happens because we do it in little chunks. It is good to reflect on some older photos.